The carver has made superb use of the differing colour tones in the material to create a lively composition. The boulder is very deeply carved, resulting in a stage-like platform at the front of the carving which draws the viewer into the intimate setting. 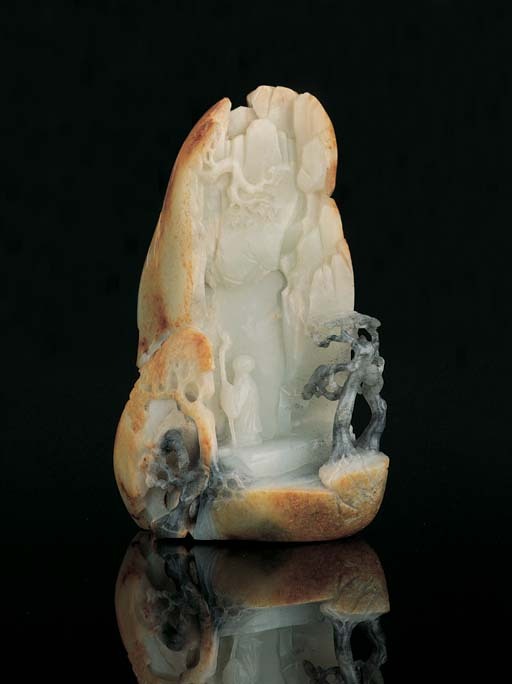 Compare the composition of the present boulder with another of celadon tone, also carved with a lone hermit, and with the addition of an inscribed poem describing the scene, from the Seattle Art Museum, illustrated by Geoffrey Wills, Jade of the East, New York, 1972, fig. 58.